Well, I seem to have completely forgotten about this post somewhere along the way. Sorry about that! 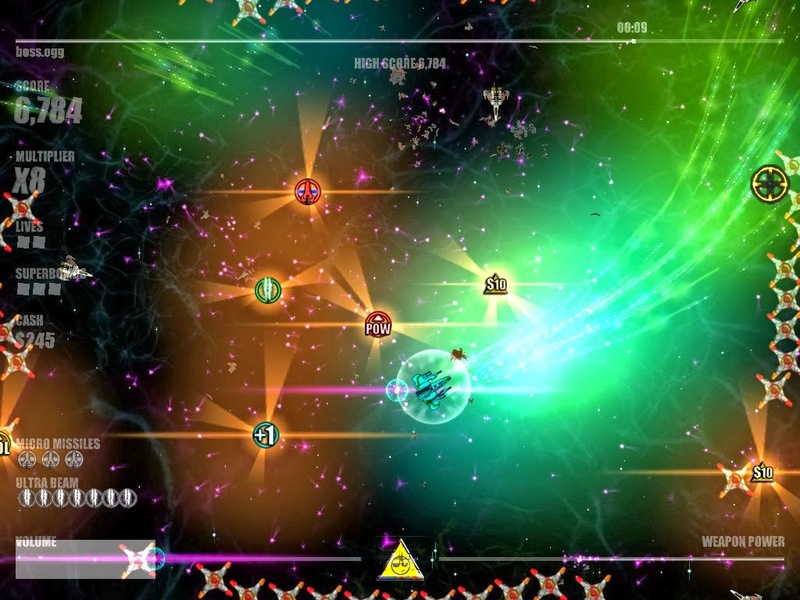 Beat Hazard is a trippy arena shooter with mechanics based on your music library. As a song that you've selected progresses, the game's speed and your ship's power scale to the intensity of the music. 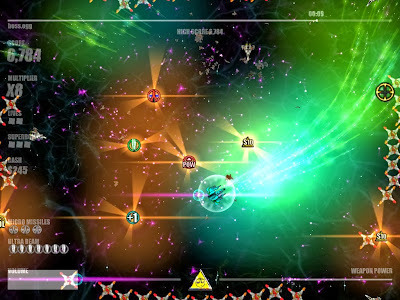 Waves of enemies and bosses fly in from all angles, and bright, colored flashes dot the arena. It's certainly something to behold. As a quick note: In case you hadn't guessed, do not play this if you're prone to seizures! Still here? Great. Fishing boss theme. Short, but gave good visuals. There's a lot to praise in this game. To start, the visuals are totally crazy. Some people may find the bright flashes of light and color annoying, but I love them. The perks that you can buy (mostly)reduce the difficulty significantly, so I feel like there's plenty of challenge for players if they want it. On top of this, the ability to turn just about any music file into a level is neat and will leave most players with more than enough content to work through. Due to all of the action onscreen, sometimes the enemies will sneak up on you. Unfortunately, since colliding with an enemy kills you, sometimes you'll suddenly die with no warning. If you play cautiously, it shouldn't be too much of an issue but it can still be a real pain. Boss fights are usually ok, but sometimes if they last too long enemies will start spawning before you're done. One final gripe is that navigating the song menu to find songs feels a bit annoying. Thankfully, it gives you the option to use your OS's default file dialog to find them. Overall, this is a pretty good game. The crazy graphics and fast-paced gameplay make for great experience. Unfortunately, the small annoyances really detract from an otherwise great game for me. 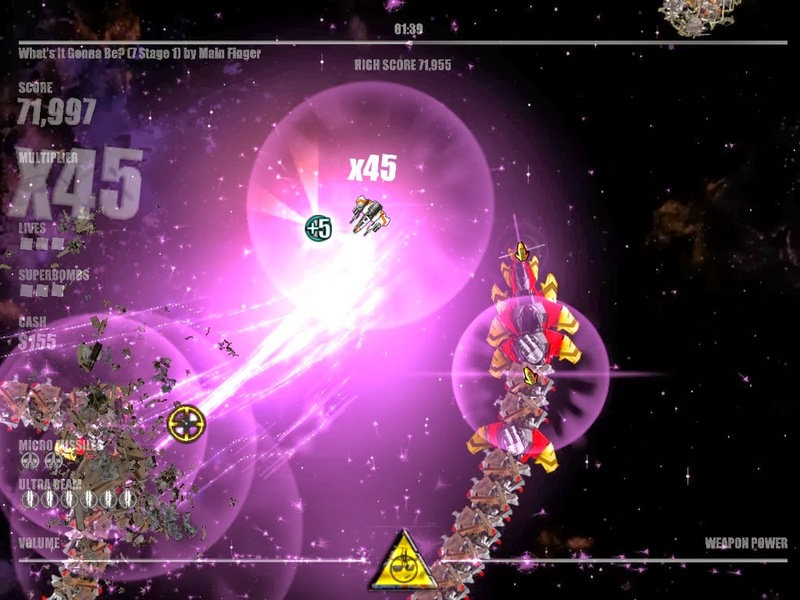 Still, if you like twin stick shooters you should definitely give this a try.